Dining in Kennebunkport is like the proverbial box of chocolates, only you can pick exactly what you want. Being right on the Maine coast obviously means a bounty of fresh seafood is served at Kennebunkport restaurants. Lobster is on most every menu, from fresh steamed lobster and famous lobster rolls at Mabel’s Lobster Claw (where former presidents dine), to chef prepared lobster creations. Kennebunkport dining can be casual like fried clams from the Clam Shack or Alisson’s for a juicy burger. 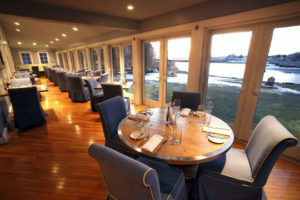 For lunch and dinner, waterfront restaurants offers window seats or outdoor decks, so you can enjoy clam chowder, lobster bisque or your favorite seafood (or a landlubber’s perfectly cooked steak) as you watch sailboats and fishermen pass by up and down the Kennebunk River. Dinner and dancing is offered at Nonantum Resort, enjoy delicious food and a spin on the dance floor to a live band. Or keep it casual with a cookout and traditional Maine Lobster outside by the pool at Rhumb Line Resort’s Admiral’s Table. Lower Village and Dock Square feature several seafood restaurants, Ports of Italy – an Italian bistro, Bandaloop – an organic restaurant serving fresh local fare, Asian and Thai places, Pedros for Mexican, Old Vines Wine Bar, and of course fresh pizza parlors. For that morning java, Mornings in Paris or Dock Square Coffee House for café and bakery fresh pastries, Maine blueberry muffins, and gourmet coffee. Your sweet tooth will be satisfied with a stop at one of Dock’s Square’s ice cream parlors like Rococco’s or Aunt Marie’s, and The Candy Man candy shop. Kennebunkport has become a destination for “foodies,” with award winning restaurants featuring Wine Spectator wine lists, and annual culinary festivals including The Kennebunkport Festival and Paint the Town Red in February. Dining in Kennebunkport will not disappoint, except that you may not have enough time to try all the tasty treats. Mabel’s Lobster Claw – 124 Ocean Ave, Kennebunkport, 207-967-2562 Mabel's servers only the freshest quality seafoods and steak. Lobsters are hauled off the pier across the street. Awesome Shore Dinner, Baked Stuffed Lobster loaded with scallops in a delicious bread stuffing and sumptuous Lobster Savanna stuffed with scallops and shrimp in our creamy newburg sauce, topped with provolone cheese. Featured on Rachel Ray's Tasty Travels Show. A must visit for those in search of the perfect Lobster Roll. Fabulous homemade pies, blueberry bread, and corn muffins baked fresh every morning. One mile from Dock Square. Indoor and outdoor dining. Open 7 days a week for lunch and dinner April to October. Reservations recommended in season for dinner. 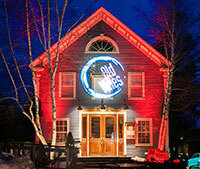 Old Vines Wine Bar – 173 Port Road, Lower Village, Kennebunk. 207-967-2310 Casual sophistication in the heart of Kennebunk’s Lower Village. Old Vines features the area’s most extensive selection of fine wine from small producers around the world, handcrafted vintage cocktails and craft brews from Maine and away. Enjoy exceptional charcuterie, artisan cheeses, homemade flatbread pizzas, fresh salads, and tapas-style small plates in our lively dining room or on our seasonal outdoor patio. Visit our website for more details about our nightly happy hour, wine tastings and other special events. Admirals Table – Turbats Creek Road off Ocean Ave, in the Rhumb Line Resort. Poolside dining located at the Rhumb Line Resort. NECN's TV Diner says The Admiral's Table is a "Kennebunkport HOT SPOT for Lobster Bakes." Open nightly in season. The poolside cabana and grill behind the Rhumb Line Resort offers affordable casual fare, cocktails and everything from chicken fingers and off the grill cheeseburgers to our famous Down East Feast complete with steamers, clam chowder, Lobster, fresh corn on the cob, and shortcake for dessert. Our French fries are fantastic, our prices are too. 207-967-5457. Seasonal Mid June to Labor Day.